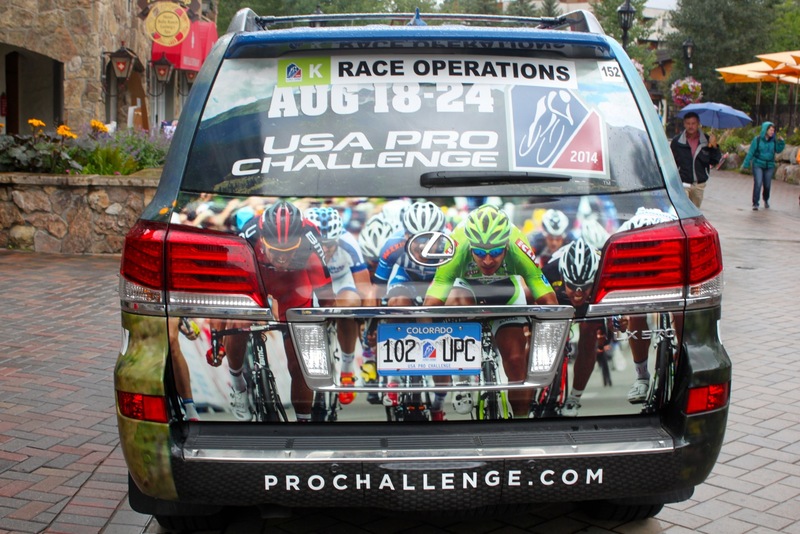 Lexus made a grand entrance into the world of tour cycling by serving as the Official Vehicle of the USA Pro Challenge this past week in Colorado. The USA Pro Challenge is the largest professional race in the United States and features some of the world’s best cyclists competing on the highest peaks the sport has ever seen. The sponsorship deal, signed through 2015, included providing 125 vehicles for the race caravan, being the presenting sponsor of the Sprint Jersey, and awarding the overall race winner with a three-year lease for a Lexus CT 200h hybrid. If you’ve never been to a cycling race or seen one on TV, you may be surprised at how many vehicles surround the race. There are many more motorized vehicles involved in producing a tour than bicycles competing in it. Besides motorbike escorts and cameramen, there is an entire flotilla of the four-wheeled variety serving a plethora of functions at a major stage race, and Lexus brought vehicles from their lineup suitable for every task to the premier American cycling race over the past week. We borrowed one of those vehicles, a 2015 Lexus RX350 and joined the festivities for the last two stages of the race in Vail and Colorado. Above you can see our ride enjoying the dirt roads high in the mountains near Vail, Colorado. We couldn’t have asked for a better mode of transport to get us to elevations of over 10,000 feet in comfort and style. It clearly beats peddling a bike up those huge peaks. While we definitely spent most of our time at the USA Pro Challenge collecting photos and videos of the race experience (for some future features), we paid particular attention to how Lexus integrated their brand into the event, and were struck by what a natural partnership this sponsorship truly is for Lexus and the USA Pro Challenge. On Saturday afternoon, we spoke with Will Nicklas, Lexus’ “corporate manager of marketing, planning, communications, and long titles” about the partnership, and he indicated that in-person spectators were a big part of the motivation to get involved with this event. While traditionally marketers target sports’ television audiences, Cycling tours are spread out over hundreds of miles and are free for spectators, which makes them the largest attended sporting events in the world. Over a million spectators in Colorado witnessed the USA Pro Challenge, and many of them also made it to the race festivals in the host cities. Above you can see a photo of the Lexus activation at the finish festival in downtown Denver, which featured the new 2015 Lexus RCF that we’ll be driving later this week in New York. 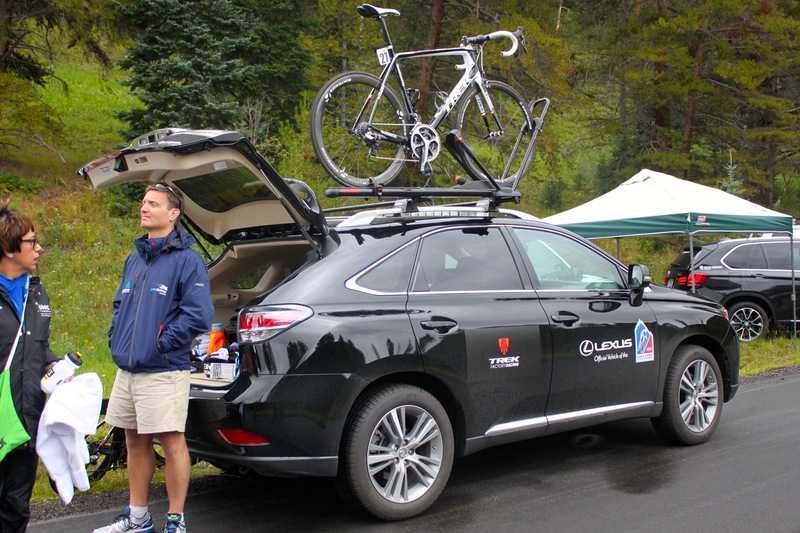 Lexus also sponsored bike valet stations in each host city, so that spectators could check their bikes while enjoying the festival. Cycling fans tend to skew younger, more affluent, and more fitness conscious when compared to the general public. All three of those groups are in the target market for Lexus, and Cycling fans are also known to be interested in technology and very active on social media. So while other brands have exited cycling sponsorships in recent years due to doping scandals, Lexus views the partnership as an opportunity to reach perspective buyers. One of the highlights of our two days at the USA Pro Challenge was jumping in a Media Car and riding up Vail Pass behind time trial riders. Above you can see the rocking scene at the top of the Pass (subject of a future feature) and below you can see one of the Race Commissioners taking advantage of the sun roof to keep an eye on his event. While fans saw the latest Lexus vehicles from the outside, race officials, cycling teams, VIPs, and media were able to experience the vehicles from the inside, providing additional value to the brand. Below you can see one of the many crossovers converted into a team support vehicle, following a cyclist up the time-trial course. So while it’s clear that the Lexus product was integrated into the event in a natural way, there was also the more traditional placement of logos and naming sponsorship taking place at the USA Pro Challenge. Below you can see race winner, Tejay van Garderen, beginning his record-breaking Time Trial up Vail Pass with some Lexus logos prominently featured in the background. Those logos displayed throughout the event obviously make their way on television and into photographs shared on social media. 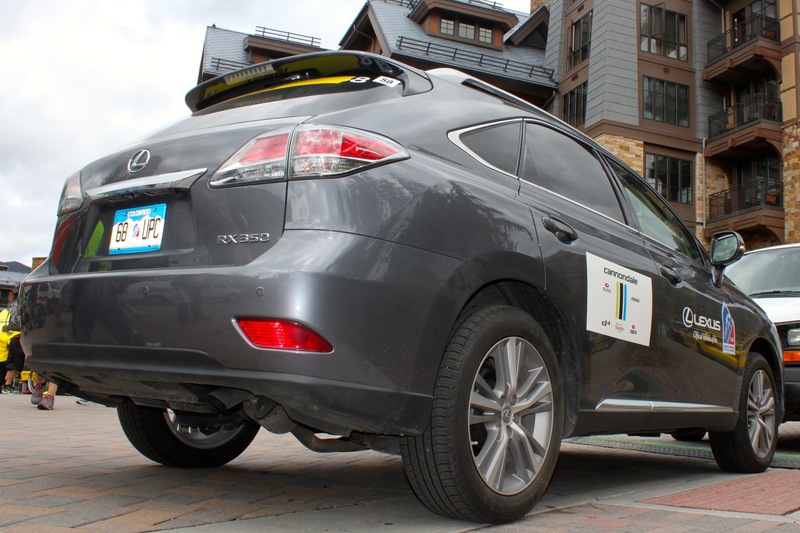 Lexus served as the presenting sponsor for Stage 6 in Vail, which was won by Tejay. This meant Will Nicklas of Lexus was given the honor of presenting at the podium ceremony. You can see him below holding up the Vail racing jersey. Nicklas actually rode the 10 mile Time Trial course himself (on a bike) earlier in the day, although we’re fairly certain that van Garderen destroyed his time. We don’t want to brag, but we snuck on the course the night before with the RX350 and easily beat them both with our record shattering climb to the top. Behind the coveted Yellow Jersey for overall race leader, the Green Jersey of the Sprint Competition is the second most important of any stage race. Lexus served as the presenting sponsor of this competition, and you can see Will Nicklas again below presenting the Green Jersey and Trophy to Kiel Reijnen at the finish line in Denver on Sunday. We swear they are in the photo if you can convince your eyes to stop staring at our new Instagram friends, the beautiful podium hostesses, Heidi and Courtney. One of the final presentations at the extended Podium Ceremony on Sunday was a three-year lease on a Lexus CT 200h hybrid to overall race winner, Tejay van Garderen. Unfortunately his teammates sprayed it with champagne while celebrating their victory in the team competition, but we’re sure the native Coloradan will be able to find someone local to wash it for him. 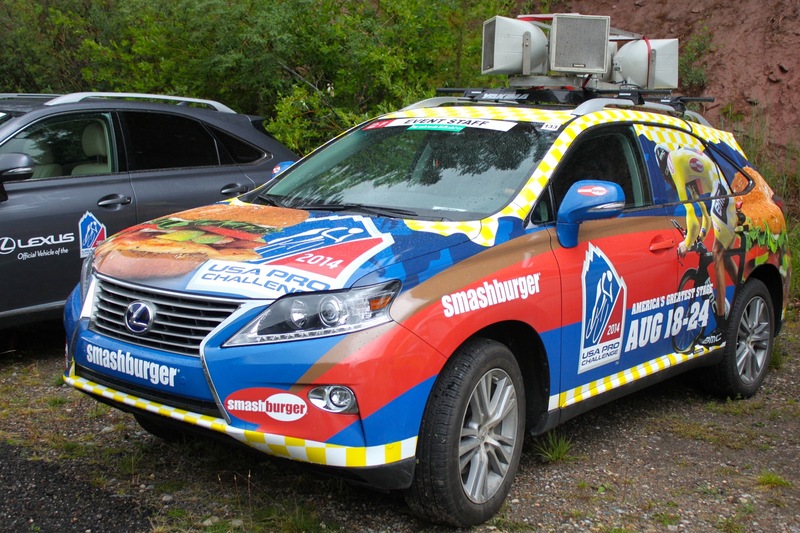 Clearly Lexus had a large impact at the USA Pro Challenge, and this type of well integrated sponsorship is key to keeping a major event like this running. We’re excited to see one of our favorite car companies getting involved with one of our favorite sports, and think it’s a partnership that will benefit both parties for years to come. The race organizers seemed particularly pleased with the comfort of their rides for the week.